Mini motorcycles are smaller, lightweight and really cheap as compared to large bikes. Although they are not as impressive as their full-sized counter parts, they are not toys. They are great for beginners who try to improve their skills before being able to ride larger bikes. Many racers have started practicing on mini motorcycles fully enjoying the excitement that these gas-and-oil engines can provide. Go for a test drive and you will see for yourself that they are pretty efficient. Lots of other names are used to refer to mini motorcycles, and here we can mention super pocket rockets, scooters or small choppers. Some models are a mix or a hybrid combining the features of regular choppers and racing bikes. The looks and the performance are pretty impressive if we think that the engine is a lot smaller. They can ride at more than 47 mph. Opinions on these pocket rockets are abundantly shared online, and the Internet has actually contributed to the popularity of these vehicles. Some online shops have specialized in a number of consumer services, helping families and individuals choose the right model. There are mini quads, pocket bikes, pocket rockets and they all come with detailed technical instructions and plenty of tips. 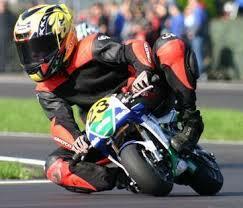 The online suggestions can actually be of real help when you want to check the safety guidelines of mini motorcycles. Another great issue here is the possibility to check the common traffic regulations that you need to follow and the necessary gear for a ride. Mini motorcycles do not work for everybody. People should take lots of issues into consideration from body size to weight. The speed and fuel consume should also be checked before making any purchase. Shop around and see whether these vehicles are a good choice for you. Ask for advice if necessary, in order not to make mistakes.